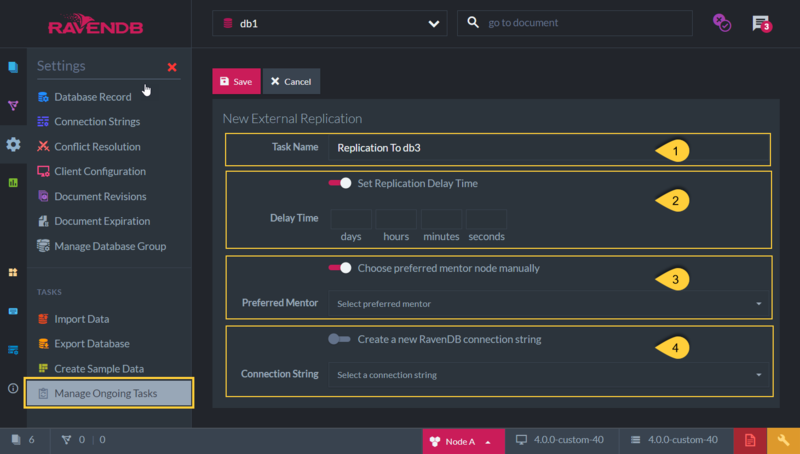 Schedule an External Replication Task in order to have a live replica of your data in another database, in a separate RavenDB cluster. The replica is up to date at all times, any changes in the database will be reflected in the replica once they occur. Note: External Replication can be defined to another database within the same cluster. That can come into use for example when you want a copy of the data that wouldn't be a client failover target. The target database is not considered part of the Database Group. Two databases that have an External Replication task defined between them will detect and resolve document conflicts according to each database conflict resolution policy. It is recommended to have the same policy configuration on both the source and the target databases. If a delay time is set then data will be replicated only after this time period has passed for each data change. Select a Connection String from the pre-defined list -or-create a new connection string to be used. The connection string defines the external database and its server URLs to replicate to. thus, a new Ongoing External Replication Task cannot be scheduled. then the task will not be active, no replication will take place. then another node from the Database Group will take ownership of the task so that the external replica is up to date. The external replication will wait until the destination is reachable again and proceed from where it left off. 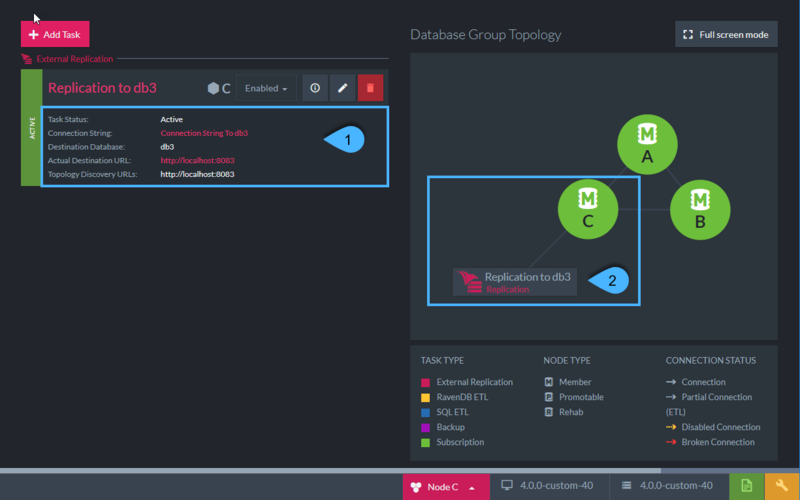 If there is a cluster on the other side, and the URL addresses of the destination database group nodes are listed in the connection string, then when the destination node is down, the replication task will simply start transferring data to one of the other nodes specified.